Happy New Year y'all and welcome to 2013...it's going to be an amazing year with many new opportunities and blessings in store for all of us! 2012 was an interesting year for me...most notably, I relocated from Atlanta to Phoenix, and as I have settled in to my new surroundings in Arizona, I have really found myself missing the regional cuisine of the south. It's the first time in my life that I haven't lived in the south. I'm on the road a lot and rarely have time to prepare the southern dishes that I love. So, on New Year's Day, I thought it would be good to make some time to do some good down home cooking that I love. 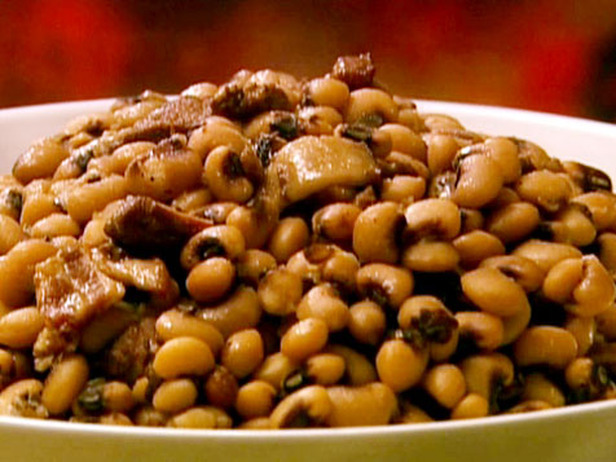 In the south, a New Year's Day meal is required to have at least two dishes: Black eyed peas and collard greens. The black eyed peas represent pennies, so that you will always have enough money. This morning, as I've been cooking, a friend from Minneapolis emailed me and said to make sure to save a dried pea and put it in my wallet to ensure that I'd never go broke. I'd used fresh shelled peas, and all the peas were already in the pot...no worries she said. Apparently, you can write "black eyed pea" on a piece of paper and place it in your wallet. So if you can't eat black eyed peas on New Year's you can always write it on a piece of paper and put it in your wallet. 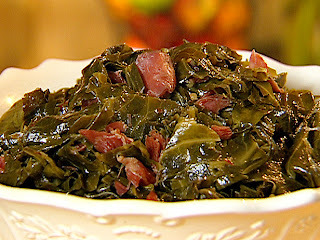 Secondly, collard greens are required. The greens represent money too; the green kind. Since I have haven't cooked "southern" in a while, I consulted with The Food Network's Down Home With The Neely's. Their cooking style is really similar to the southern cooks, my mother and grandmothers, I watched as a kid. I only used The Neely's recipe as a reference. I used fresh shelled peas, they used dried...and like a true southerner...I boiled ham hocks with my peas. Using fresh peas is a real time saver...dried peas have to soak over night. I think black eyed peas are really nutritious too, but once you add the ham hocks...hmm? For this special meal, they are wonderful! Collards require a little extra attention though. Again, I consulted the Neelys recipe. Their recipe is great...I followed it generally, but I fried some of the ham hocks after boiling and sauteed chopped garlic and onions with the ham and placed them in the greens and hocks to boil. The ham stock from boiling the hocks is liquid gold to a southern cook; almost as valuable as bacon grease. For some reason, collard greens aren't that popular in the southwest...I had to drive to two different stores to find them. In the south, the grocery stores have large displays of fresh greens from Christmas through New Years. I am glad I searched out some fresh greens in Phoenix...the aroma wafting out of the kitchen is wonderful. If you've never prepared greens before, here are a couple tips...wash the greens about 5 times. Fill up the sink and submerge the greens in the water. Wash them thoroughly to remove any sand or grit. It will take a few times. And make sure to remove the stems. To remove the stems, fold the leaf in half and rip off the spine or stalky part of the leaf. I always tear my greens too, the Neelys said to chop them. I prefer to tear the leaves into about 2 inch sections. If you want the "full on" southern greens experience, drizzle some apple cider vinegar or Sport Pepper Vinegar on your greens right before you serve them. YUM! In my neck of the wood's country ham is almost always served for special meals, and I gotta tell you...it's some good stuff. It's air dried, smoked ham that is much like Italian prosciutto or Serrano ham. And in my neck of the woods, preparing country ham is a big deal! They have contests and festivals dedicated to the country ham. I have a couple of favorite places to get this southern delicacy...Broadbent's near Cadiz, Kentucky offers some of the finest hams in the south. They consistently win awards all over the US for their hams. They ship! I also love hams from Col. Bill Newsom's Country Hams. They have received accolades from Bon Apetit, Southern Living, The New York Times, and many others...they've been in business in Princeton, Kentucky since 1917...they know their ham. 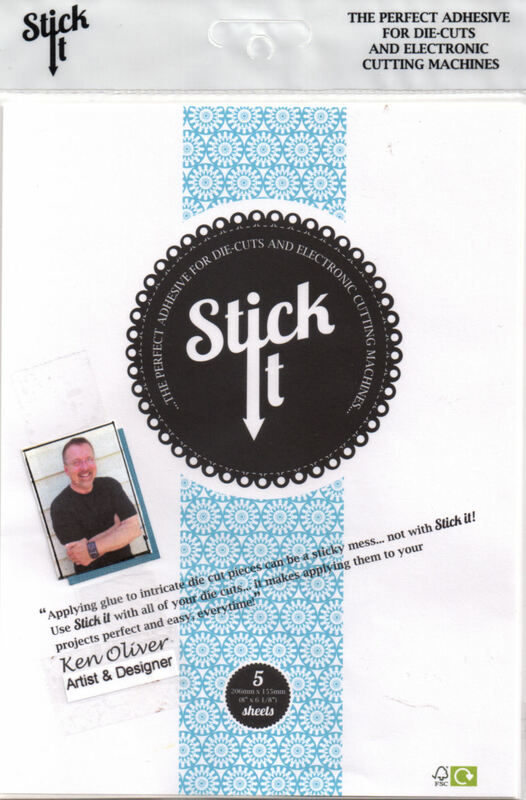 They have a cool store with more fun southern stuff than you can imagine...and they ship! A country ham needs to be soaked in water over night before cooking...it rehydrates the ham, and helps to remove some of the salt used during the curing process. 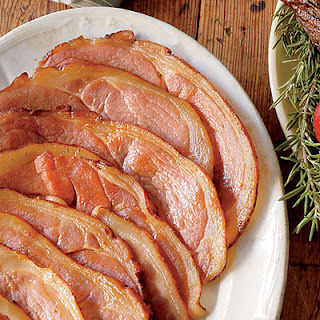 There's a specific way to cook the best country ham...slice your ham, then heat the slices in a cast iron skillet...when the ham starts to sizzle...pour Coca Cola over it...the Coca Cola glazes the ham slices and makes it sweet and salty...it's a southern delicacy...great on biscuits too! The last dish required for the traditional southern New Years Day meal is fried cornbread. 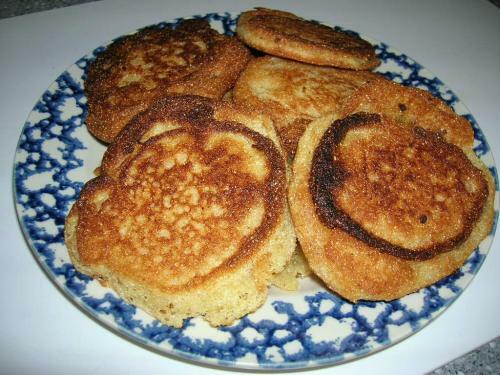 You might be thinking that this looks like a pancake...not cornbread...it's the tradition in the south to fry cornbread...you might also know it as Johnny Cakes or Hoe Cakes. Folklore has it that slaves prepared cornbread on their hoes, placed in a fire, hence the name hoe cake. Although, I have made cornbread a thousand times, and watched my mom make it all my life, I got a little advice today from The Southern Lady Cooks. I followed The Southern Lady's recipe, except, I added a little sugar to the batter, and before I fried the cornbread, I fried a little piece of ham hock in the grease to give the cornbread a smoky flavor. Depending on what you'll serve the cornbread with, you may add some additional ingredients. If you are serving with fried fish, add chopped onions and you've got hush puppies...or if you want to serve it for breakfast add in some "cracklins" to the batter and serve it with butter and syrup like pancakes. Cracklins are pieces of deep fried pork skin. When I was young, my grandmother would make cracklin bread for breakfast and served it with Brer Rabbit Syrup, great memories for this southern boy. I was feeling really ambitious with this meal so I baked a Buttermilk Pie for dessert. I found a great recipe over at Deep Fried Kudzu that was perfect. I've also used a Southern Living Buttermilk pie recipe that is great! Buttermilk pie, also called chess pie is a creamy old fashioned custard pie. It's really my favorite pie. The thing that makes this pie special is the addition of a couple tablespoons of ground corn meal to the custard filling. The cornmeal rises to the top of the custard while baking and makes a delicate "crust" on the top of the pie. It's down home, lip smackin' goodness! When you find out how easy it is to make this traditional southern pie...you might just get addicted to it. It's that good! So as I've been cooking, I have sampled along the way (as any true southern cook would do) and everything is delicious! The smells, the ingredients, and the cooking methods have all reminded me of my southern roots, and this is the perfect traditional southern meal for New Year's Day! I am really excited to get this meal served up and on the table,so if you'll excuse me...I am gonna run for now. Thank you for letting me share the perfect Southern New Year's Day meal with you and Happy New Years! I wish you health, wealth, and all the happiness you can stand in 2013! Wow, what a meal, I had to show my husband what you made, he's a southern boy too!! However I am a city girl but my parents were southerners. I do have to say your meal looks gr8t!!!! Thanks Melissa...it was really good too! To me it's southern comfort food! Happy New Year! Ahhh, thanks for the memories Ken!! I'm from Alabama and this is a meal that I remember eating SO many times. Dinner was not complete without a big pan of cornbread. I loved crumbling it in a glass of milk with salt and pepper for dessert. YUM! My husband is from Germany and was raised in the Chicago area...so I about the only thing I can put on the table from this meal now is black-eyed peas. Hope you have a wonderful and prosperous New Year! !